Madonna has made a career of anticipating trends while also setting them. The Material Girl has been such a crucial figure in the history of not only pop music but also pop culture for the last 25 years, and this appropriately-titled double-disc compilation is evidence of her iconic status. The most expansive career-spanning chronicle of Madonna’s music, Celebration is remarkable of how the singer has evolved musically and stylistically: from the innocent (and now nostalgic) early ‘80s club hits of “Everybody” and “Holiday” to mature pop of “Like a Prayer and Take a Bow” to the current electronic and dance-inspired music of “Music” and “Hung Up.” And did I also mention “Like a Virgin,” “Vogue,” “Into the Groove,” “Live to Tell,” “Ray of Light”…well, you get the picture. The two new songs aren’t filler by any chance: “Revolver” featuring Lil’ Wayne is very catchy and buzzy hip-hop music while the beat-heavy, pumping title track, a collaboration with Paul Oakenfold, is destined to be another dance hit. Of course it would have been impossible to include every Madonna single, which meant tracks like “True Blue” “Causing a Commotion,” “I’ll Remember” and “Deeper and Deeper” are unfortunately not on this compilation. (Those will probably be for the hypothetical box set). 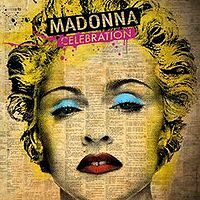 Still Madonna’s body of fine work and musical phases are well-represented on Celebration.